A CAPTCHA is a challenge-response test often used on the Web to determine whether a Web site’s visitor is a human or an automated program (so called bot). Existing and widely used CAPTCHA schemes are based on visual puzzles that are hard to solve on mobile devices with a limited screen. We propose to leverage movement data from hardware sensors to build a CAPTCHA scheme suitable for mobile devices. Our approach is based on human motion information and the scheme requires users to perform gestures from everyday life (e. g., hammering where the smartphone should be imagined as a hammer and the user has to hit a nail five times). We implemented a prototype of the proposed method and report findings from a comparative usability study with 50 participants. The results suggest that our scheme outperforms other competing schemes on usability metrics such as solving time, accuracy, and error rate. 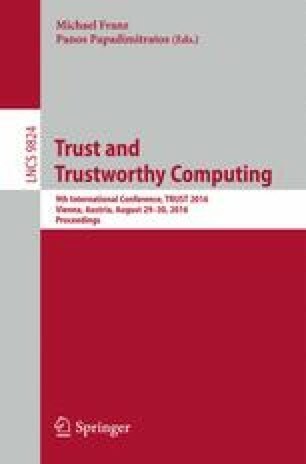 Furthermore, the results of the user study indicate that gestures are a suitable input method to solve CAPTCHAs on (mobile) devices with smaller screens and hardware sensors.